The 2017 SCEH Conference will be held across two locations, connected by a walkway. See directions below. Our contemporary hotel puts you in the middle of downtown Chicago's bustling River North area. Featuring upscale lodging atop the famous Chicago Sun-Times building, we're next door to the Merchandise Mart and within walking distance of the Loop, the main business district, and the Magnificent Mile. At our hotel near Chicago's chic shops and restaurants you're close to attractions like Navy Pier, Millennium Park, Chicago Theatre, 360 Chicago and the Willis Tower Skydeck. Each one of the 521 newly redesigned, upscale guestrooms and suites features contemporary furnishings and plenty of light with many providing premium views of the Chicago skyline. Get down to business with large work desks, refresh after a long day with premium bath amenities, and rest soundly on luxurious Serta mattresses. Towering views greet you every morning, while modern conveniences keep you connected and ready to explore the best of the Windy City. Enjoy spacious, remodeled rooms with incredible views, free Wi-Fi and cable TV. Stay connected with free Wi-Fi, enjoy the convenience of laundry facilities, and take advantage of one of the best parking values in the city.Take a relaxing dip after a long day or swim your daily laps to stay fit in our indoor pool located on the 16th floor, open 5:00 am to 11:00 pm daily. Guests also have access to a dry sauna. Complimentary towels are always provided. Located on the 15th floor, our 24-hour self-service business center accommodates your work needs with faxing and printing. And keeping in shape is no sweat with modern weight and aerobic machines in our fitness center. Guests have access to 5 exercise bikes, 5 treadmills, 4 elliptical trainers, 1 rowing machine, 1 adaptive motion trainer, 1 universal gym, plus an assortment of free weights and medicine balls. Hotel Room Block -- Just Extended! Our special group rate is in effect until Friday, October 6 (just extended!) or until we sell out. A few rooms are still available. Reserve now to get the group rate. Check-in time is after 3:00 pm and check out time prior to 12:00 pm. WIFI: Complimentary high-speed wireless Internet access in meeting rooms, foyer space, and guestrooms is included. IMPORTANT NOTE: Early Departure Fee -- In the event a guest who has requested a room within the block checks out prior to the guest's reserved checkout date, the Hotel will add an early checkout fee of $179 to that guest's individual account. Guests wishing to avoid an early checkout fee should advise the Hotel at or before check-in of any change in planned length of stay. The Hotel will inform members of the Group of this potential charge upon check-in. We encourage you to make your hotel reservations as soon as possible. We expect rooms to go quickly. The nearest airport to the hotel is Chicago's O'Hare International Airport. The hotel does not have an airport courtesy shuttle, but you may find transportation options at the Visit Chicago website. Driving to the Holiday Inn Mart Plaza? Our hotel is conveniently located in downtown Chicago and easily accessible by car. Guests enjoy self-parking for $35 a night with unlimited in-and-out privileges. 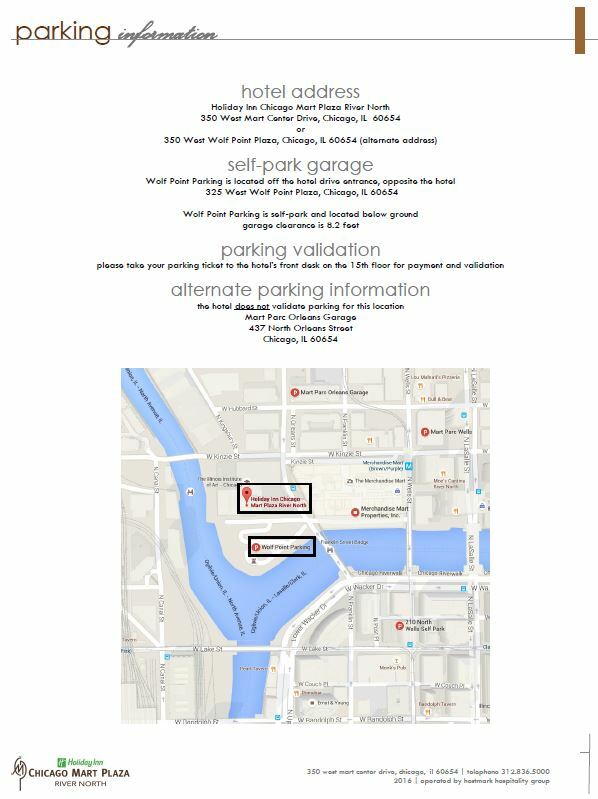 Wolf Point Parking is located off the hotel front drive entrance. Garage clearance is 8.2ft. See detailed driving directions. Note: the Hotel Lobby is on Floor 15 of the building. The Holiday Inn Chicago Mart Plaza is pleased to offer reduced self-parking for 2017 SCEH Annual Meeting overnight guests at $35.00 inclusive per day, per auto/van with in and out privileges. The reduced parking fee for meeting-only attendees is $20.00 and does not include in and out privileges. All parking tickets should be validated at the Front Desk of the Hotel for overnight guests and event attendees to obtain the discounted parking fee. This fee is subject to change without notice. Attendees will have coffee service and two scheduled snack breaks per day. Meals are NOT included in the registration fee except for the Annual Banquet on Sunday.for those who purchase a package containing this option. SCEH members in good standing are invited to attend a Members Luncheon and Business Meeting on Saturday at the college. Savor your hotel stay with something special, day or night. Stop in on the 15th floor and visit Merchants Market for hot and cold signature sandwiches, salads, coffee, beer, and wine. Take your meal back to your room, or cozy up to the window counter with an incredible view of the river and skyline. Try out the original menu at Merchants Cafe, offering a fresh take on traditional cuisine with "elevated comfort food." Dig into a hearty breakfast buffet, or feast on sizzling ribs, classic burgers, and fresh fish. The cafe also offers seasonal salads and lighter fare like individual flatbreads and appetizers. Compliment your meal with a selection of international wines, cocktails, and craft beers. At the end of the day grab a table at our Cityscape Bar for sunset views of the Chicago skyline. Relax with a drink or specialty beer, socialize with friends, and order dessert. For our guests' convenience, our culinary team is also happy to serve you something delicious in the comfort of your room. Learn more about restaurants at the hotel. View a list of food service establishments inside the Merchandise Mart. View a searchable list of Chicago restaurants. Located directly on the famous Chicago River in the heart of downtown Chicago, The Chicago School of Professional Psychology’s Chicago campus is centered in one of the most vibrant and exciting cities in the United States—offering students the chance to build relevant field experience while pursuing degrees ranging from counseling to organizational leadership. An accredited, not-for-profit institution focusing exclusively on psychology and related behavioral sciences, The Chicago School has been an innovator for more than 35 years. Through a vast network of agencies, community-based organizations, and practicing professionals, our Chicago Campus offers a remarkable level of field experience and networking opportunities. Students working in our school-run institutes, centers, and clinics are immersed in a multicultural learning environment, building experience as they make a meaningful difference in local communities. Through hundreds of training prospects, Chicago students conduct research and assessments, provide counseling and clinical services, assist with developing and launching new programs, and participate in strategic planning efforts. One of the largest psychology-focused graduate schools in the Chicago area, this campus offers a full continuum of graduate programs in relevant and quickly growing areas of psychology; degrees are available at the master’s, education specialist, doctoral, or certificate level. Providing services to the communities that surround it, our Chicago Campus offers exclusive programs and concentrations that examine the needs of an evolving, increasingly global society. Our faculty members are active practitioners and leaders in their fields of expertise, bringing a wealth of first-hand insight into the classroom. By dedicating themselves to the success of our students, they have helped build and maintain some of the most academically rigorous psychology-based programs in the country. The Chicago School is dedicated to maintaining programs of the highest quality; our Psy.D. in Clinical Psychology at Chicago is accredited by the American Psychological Association (APA). The Chicago campus of the TCSPP is just steps away from Lake Michigan, the theatre district, the famed Magnificent Mile, dozens of museums, and some of the world’s top restaurants and clubs. Sometimes described as a colorful “patchwork quilt” of diverse neighborhoods—including Greek, Chinese, Indian, Irish, Jewish, Mexican, Native American, African-American, Polish, Swedish, Tibetan, Ukrainian, and more—Chicago provides a true multicultural environment for your educational training. View a map here. Walking from the Hotel to the TCSPP will take about 10 minutes. Please allocate an extra 10 minutes to arrive, take the elevator and find your classroom. There is a walkway in the Merchandise Mart so that most of your walk is inside. At the end of the walk, you will need to cross the street to gain entrance to the TCSPP. View detailed walking directions here. For those visiting by car, TCSPP does not have on-site parking; however, the Mart Parc Wells Self Park lots are located close to campus. The Chicago School was founded in 1979 by a group of psychologists and educators committed to advancing the field and providing professional training in a nonprofit setting. The school’s road to accreditation began during its first academic year. In 1980, The Commission on Institutions of Higher Education of the North Central Association of Colleges and Schools (NCA) awarded candidate-for-accreditation-status to The Chicago School, with accreditation first awarded in 1984. The Clinical Psy.D. Department in Chicago was awarded Provisional Accreditation by APA in 1987, and Full Accreditation in 1992, a status that it retains. During the summer of 1979, the school became an affiliate member of the National Council of Schools and Programs of Professional Psychology (NCSPP). In 1980, the school’s status was raised to associate membership; in 1985, The Chicago School was made a Full Member of NCSPP. The Chicago School began its first classes at temporary quarters located at the YMCA Building located on 30 West Chicago Avenue. The school moved to the Fine Arts Building on Michigan Avenue in 1980. In 1986, following an extensive search, the school moved to its next location, the historic Dearborn Station in Chicago’s South Loop. By the mid 1990s, The Chicago School was earning a national reputation for its emphasis on diversity and multiculturalism in the psychology profession. It has twice been recognized by NCSPP for significant contributions, first in the area of diversity, and most recently for outstanding advocacy for the field of psychology. A new era began in 2004 when the school moved to its current Midwest home on the Chicago River at 325 North Wells St. Space across the street in the Merchandise Mart was eventually added to accommodate classrooms and faculty offices for new programs in applied fields such as Applied Behavior Analysis, Counseling, Forensic Psychology, Industrial/Organizational Psychology, and School Psychology. Expanding the school’s mission to new communities continued in 2006 with the addition of Online programs and certificates. It was followed by a Board of Trustees-led project in 2007 to establish a national presence for The Chicago School of Professional Psychology with locations on the West and East coasts. The Chicago School Los Angeles Campus opened in summer 2008, and two more campuses in Southern California followed with the acquisition of the California Graduate Institute: one located in L.A.’s Westwood neighborhood and the other in Irvine, Calif. The East Coast side of the initiative was realized in fall 2010 with the opening of a campus in the nation’s capital. Today, the school has more than 4,300 students studying in one of more than 20 degree programs making it the largest nonprofit professional psychology school in the nation. Chicago has been named the Fourth Best City in the U.S. and Canada (Travel + Leisure, 2013), Top City Break Destination (Frommer's 2012), Best in Travel - Top 10 Cities (Lonely Planet, 2014). Situated squarely in the center of the country, Chicago is easy to travel to from virtually anywhere. Thanks to thousands of flight options, six class-one railroads, a vast network of major highways and a wide variety of airlines, it's also one of the most cost-competitive cities in the United States. Culturally diverse and well educated, Chicago's four-million-strong private-sector workforce puts a dynamic and thriving business community within a few miles of your meeting. Twenty-nine Fortune 500 companies are headquartered in the area, including six in the city. This city is a premier technology hub that has always pushed the boundaries of innovation and engineering, and its meeting rooms, convention center, hotels and event venues are packed with advanced technologies to elevate your meeting. Additional information is available at the http://www.choosechicago.com. For a list of nearby attractions and their proximity, see the hotel's website here.